In 2014, the year of GI Joe’s 50th anniversary, what sort of figures are being released to pay tribute to the brand’s 1960s origins? Well, none to speak of. 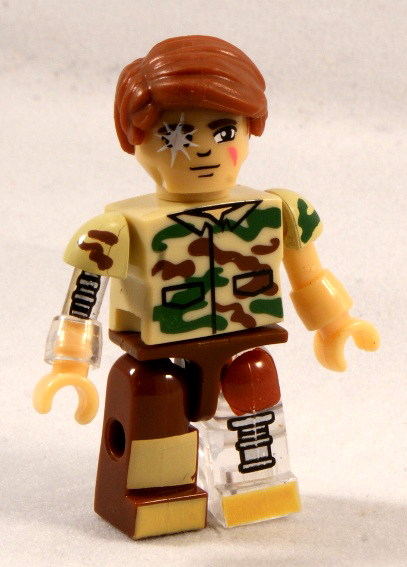 In fact, the only homage toys celebrating the first generation of Joes, outside of a Collectors Club convention exclusive offering, are Kreons based on 1970s figures. More than a bit of a bummer. Considering that the two mentioned are the Air Adventurer and Atomic Man here, I’m not at all upset by the choices. While I am disappointed in the lack of actual twelve inch figures, the Kreons are a fun bunch of toys to hunt down. In fact, it seems that the Kre-O line is the perfect format to mix various eras without either modifying old designs or subjecting collectors to decade whiplash. All the generations of Joe seem to get along swimmingly in the brick format. While I’ve found a lot of favorites among these tiny, simplified versions of the Joes, Atomic Man’s wonderfully toyetic elements have placed him squarely at the top of my list. Why? Two words: clear plastic. It’s like toy ambrosia to a geek like me. I’m endlessly fascinated with the magical qualities that clear, glow in the dark, and chromed plastic can lend to toys. 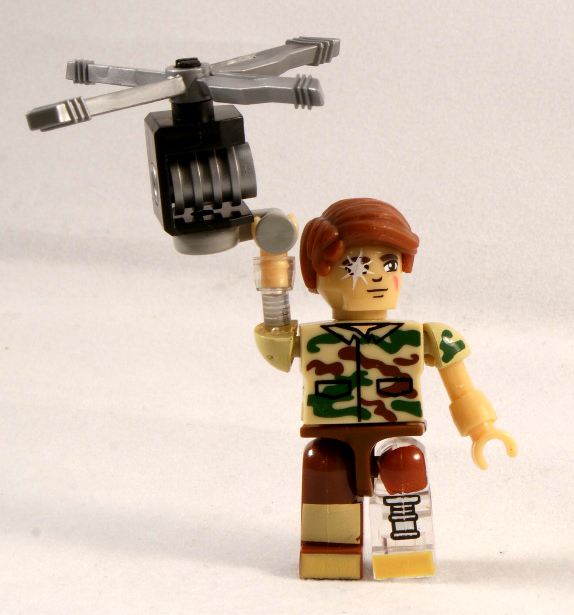 Add to that a personal hand-held copter and bionic eye and you’ve got a bite-sized blast of pure toy joy. Bravo, Mr. Power. Give him some white hair and you’ve got Cable. But does that Cable come in HD? My brother just snagged me almost the entire whack of Wave 3 (Lady Jaye remains unsurprisingly elusive) and Atomic Man is a real standout. There’s really great stuff in there, but even though I have no attachment to Atomic Man, I really love this little guy. Yeah, the clear plastic is awesome, but I really love his handcopter. That’s a neat little accessory and I’m glad they threw something other than an adventurer into the Kre-O line as a nod to the Adventure Team days. Can a Bullet Man be far behind? He looks like the six million dollar man. Kre-O is my only real connection to the old Joes, so it’s kinda fun that Hasbro is doing at least these guys. I’ve got no room to start collecting 12″ figures, but you can fit a ton of Kreons in a shoebox!